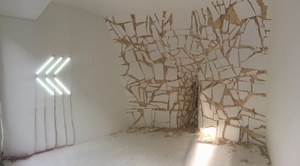 Deok Yeoung Gim's work focuses on the coexistence of two opposite sides, such as outside and inside, kernel and shell, truth and illusion, which are ultimately connected to each other. In his Parasite Projects, he concentrates on resulting shape and images of the internal reaction. Starting with the Parasite Projects #1 in 2010, the Parasite series explores a story of tumor-like parasitic formations that uncontrollably proliferates on mundane objects and at the end encroaches them. The surface, with its massive proliferation, is destroyed and transformed. Pulled or pushed, the surface overcomes the tension between exterior and interior, and keeps its balance exposing the varying energy flow underneath. The lighting installation with the same title embodies the 'rewind' sign on a video player. This new series shows a convergence of concerns behind the artist's two representative series works, the wall installations and communication using literal symbol. Composed with 6 florescent lighting tubes, the 'rewind' sign symbolizes the continuity of past and present, leading us to the artist's continuing examination into "communication."